Carpe is the second-person singular present active imperative of carpō "pick or pluck" used by Horace to mean "enjoy, seize, make use of". Diem is the accusative of dies "day". A more literal translation of carpe diem would thus be "pluck the day [as it is ripe]"—that is, enjoy the moment. 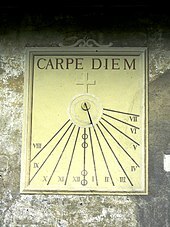 In Horace, the phrase is part of the longer carpe diem, quam minimum credula postero, which can be translated as "Seize the day, put very little trust in tomorrow (the future)". The ode says that the future is unforeseen and that one should not leave to chance future happenings, but rather one should do all one can today to make one's future better. This phrase is usually understood against Horace's Epicurean background. The meaning of carpe diem as used by Horace is not to ignore the future, but rather not to trust that everything is going to fall into place for you and taking action for the future today. Collige, virgo, rosas ("gather, girl, the roses") appears at the end of the poem "De rosis nascentibus" ("Of growing roses", also called Idyllium de rosis) attributed to Ausonius or Virgil. It encourages youth to enjoy life before it is too late; compare "Gather ye rosebuds while ye may" from Robert Herrick's 1648 poem "To the Virgins, to Make Much of Time". "De Brevitate Vitae" ("On the Shortness of Life"), often referred to as "Gaudeamus igitur", (Let us rejoice) is a popular academic commercium song, on taking joy in student life, with the knowledge that one will someday die. It is medieval Latin, dating to 1287. Related but distinct is the expression memento mori (remember that you are mortal) which carries some of the same connotation as carpe diem. For Horace, mindfulness of our own mortality is key in making us realize the importance of the moment. "Remember that you are mortal, so seize the day." Over time the phrase memento mori also came to be associated with penitence, as suggested in many vanitas paintings. Today many listeners will take the two phrases as representing almost opposite approaches, with carpe diem urging us to savour life and memento mori urging us to resist its allure. This is not the original sense of the memento mori phrase as used by Horace. In modern English, the expression "YOLO", meaning "you only live once", expresses a similar sentiment. In the 1989 American film Dead Poets Society, the English teacher John Keating, played by Robin Williams, famously says: "Carpe diem. Seize the day, boys. Make your lives extraordinary." Later, this line was voted as the 95th greatest movie quote by the American Film Institute. ^ Lewis, Charlton T. (1890). "carpō". An Elementary Latin Dictionary. New York, Cincinnati, and Chicago: American Book Company. ^ Ackerman, Susan (2005). When Heroes Love: The Ambiguity of Eros in the Stories of Gilgamesh and David. Columbia University Press. pp. 130–131. ISBN 978-0231132602. ^ Perdue, Leo G. (2009). Scribes, Sages, and Seers: The Sage in the Eastern Mediterranean World: The Sage in the Mediterranean World. Vandenhoeck & Ruprecht GmbH & Co KG. p. 57. ISBN 978-3525530832. ^ Harrison, S. J. (2012). The Cambridge companion to Horace. Cam Press. pp. 154, 168. ISBN 978-0-521-83002-7. ^ Jacks, Lorra (February 17, 2013). "The 5 Most Frequently Misused Proverbs". Cracked.com. Retrieved 2014-01-02. ^ "Carpe Diem! How the philosophy of 'seize the day' was hijacked". iNews. 2017-04-18. Retrieved 2018-03-17. ^ "YOLO | Definition of YOLO in English by Oxford Dictionaries". Oxford Dictionaries | English. Retrieved 2018-03-17. ^ American Film Institute. "AFI's 100 YEARS...100 MOVIE QUOTES". Afi.com. Retrieved 2015-03-25.